We should all have a solid command of the ABCs of baking. Thankfully, Food52's Test Kitchen Manager Erin McDowell is here, with tips and tricks to help you master the most essential desserts and the simplest breads. 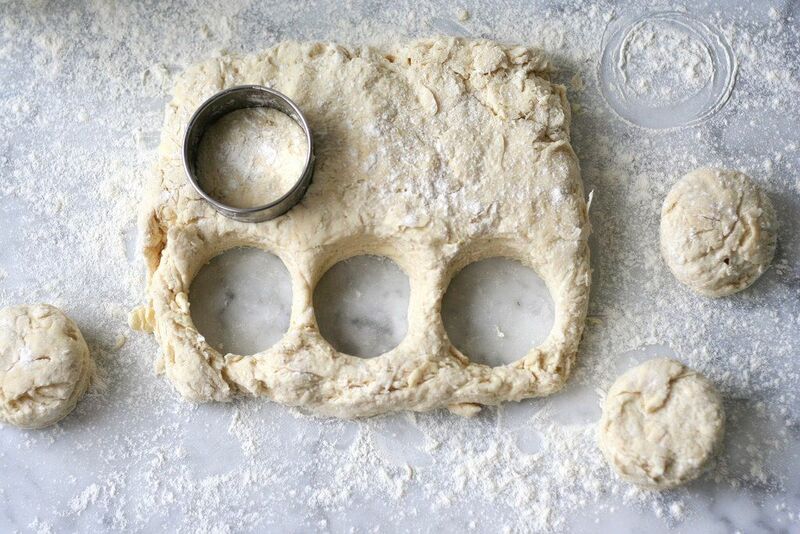 Today: How to make perfectly flaky buttermilk biscuits -- no Southern drawl required. I’m not from the South; I didn’t grow up with White Lily flour on my mother’s countertops, and I didn’t fry anything in bacon grease (gulp) until my early twenties. But biscuits were still a pretty important part of my upbringing in the midwest. We eat a lot of fried chicken out there. And in my world, biscuits are crucial to the consumption of fried chicken. Regardless of the path that got me here (which may be littered with hundreds of fried chicken crumbs), I have a fair share to say about buttermilk biscuits. It may not all be "authentic" -- I may opt for boosted flavor over perfect appearance and throw in an entirely non-traditional (and totally optional, if you’re a purist) garnish -- but stay with me here. A slew of holiday meals are headed your way, and we should all be armed with a solid biscuit recipe to get through it all. Take a flour inventory. As nearly every biscuit recipe from trusted sources will tell you, White Lily flour is the absolute best. 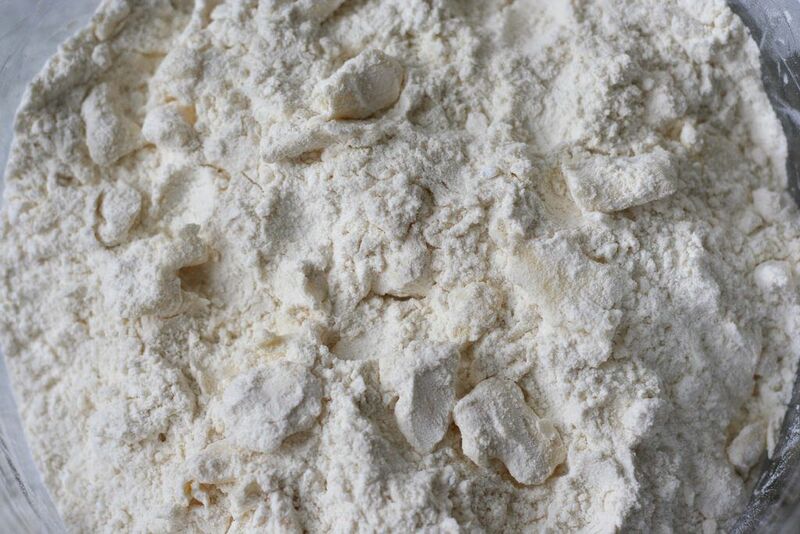 White Lily is a flour commonly available in the South -- it’s a bleached flour made from soft winter wheat and has low protein levels (9 to 10%). Most White Lily flour is also self-rising, though it is also available without the addition of a leavener. In this way, it’s most similar to cake flour, which also has low protein levels (8 to 10%), is commonly bleached, and will lend a similar tenderness to the finished biscuit. That’s really what all this mumbo-jumbo is about: You want to use a flour that won’t get overworked, will stay tender, and will produce a light-as-air, flaky biscuit. But to be honest, I’ve made my recipe with all-purpose flour in a pinch, and it works pretty well. Choose your fat wisely. 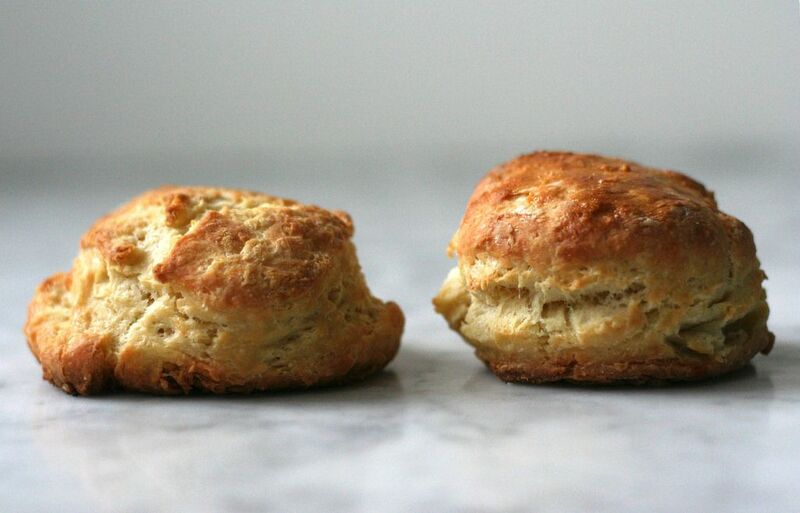 Biscuits can be made with lard, and they are great made with bacon fat. But for me, nothing beats butter. The sweet flavor of the butter best complements the natural flavor of the buttermilk. Lard and bacon grease biscuits may be flaky, but the flavor is more neutral or smoky, respectively. If you do use butter, I highly encourage you to choose a high-fat, flavorful one (like Kerrygold or Plugra). Whatever fat you use, make sure it’s nice and cold before you begin mixing. 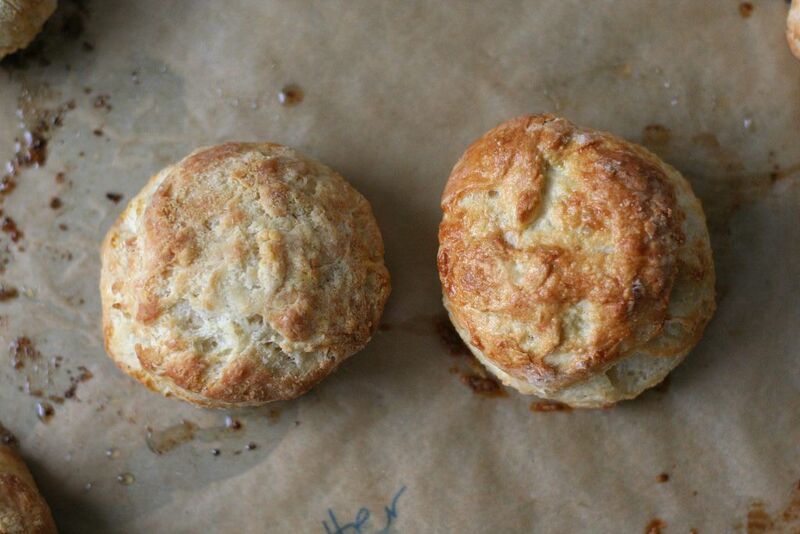 More: Our community has great advice for how to make perfectly flaky biscuits, too. Know your leavener. Many Southern recipes for biscuits use White Lily self-rising flour and also add more leavener (usually baking powder). 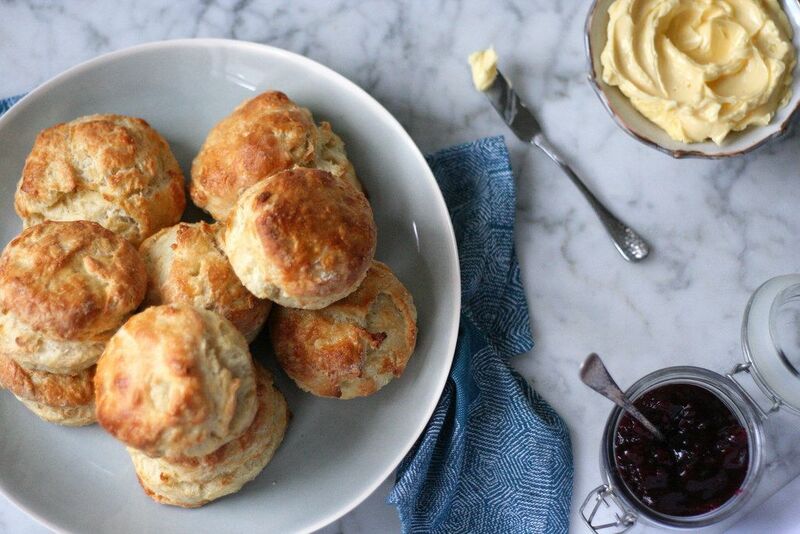 It may seem like a lot, but biscuits are not a time to skimp on it. 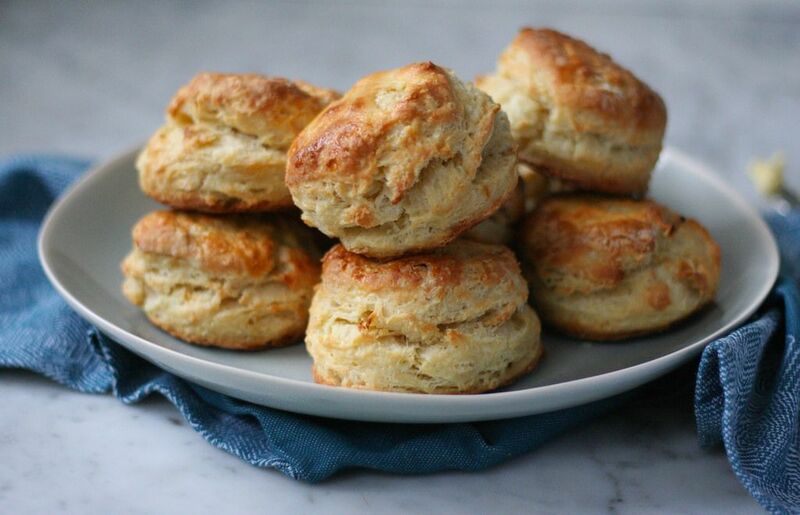 Aside from the little bit of steam you get from cold butter hitting the heat of your oven, biscuits rely exclusively on chemical leaveners -- there are no eggs to make them light and fluffy. Baking powder -- a mixture of baking soda (sodium bicarbonate), cornstarch, and a powdered acid -- is the most commonly used chemical leavener for biscuits. It creates carbon dioxide when it hits the heat of the oven and must be activated by the presence of an acid. Double-acting varieties, which are common, activate when hydrated (mixed into a batter or dough), as well as when they hit the heat of the oven. A generous amount of baking powder is crucial to light, fluffy biscuits -- but too much will lend a chemical taste to your final result. Don’t skimp on the buttermilk. Use the good stuff. Buttermilk is traditionally low in fat (1.5% is the average for most available brands), and if there was ever a time to find the good, local product, this is it. You really can taste the difference when you use a fresh variety. Sometimes I’ll even “make my own” by adding vinegar to high-quality local milk (a good rule of thumb is 1 teaspoon vinegar to 1 cup of milk). Take a note from pie dough. Remember everything you’ve learned about mixing pie dough? 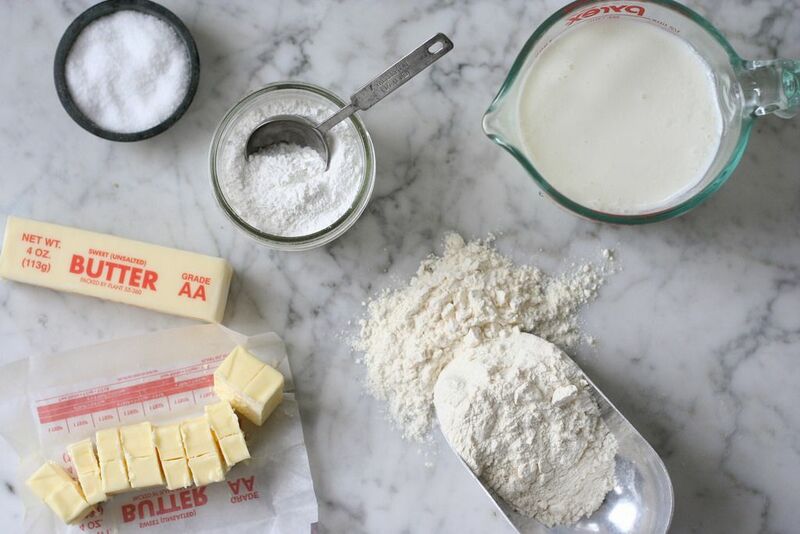 The process of making biscuits is really quite similar: Rub the cold butter into the flour to create shingled pieces of fat throughout the flour. The idea is to create a shaggy, mealy mass with butter pieces ranging from the size of a walnut half to the size of a pea. Whatever you do, don’t roll out the dough. Biscuit dough should be handled as little as possible to keep it tender. 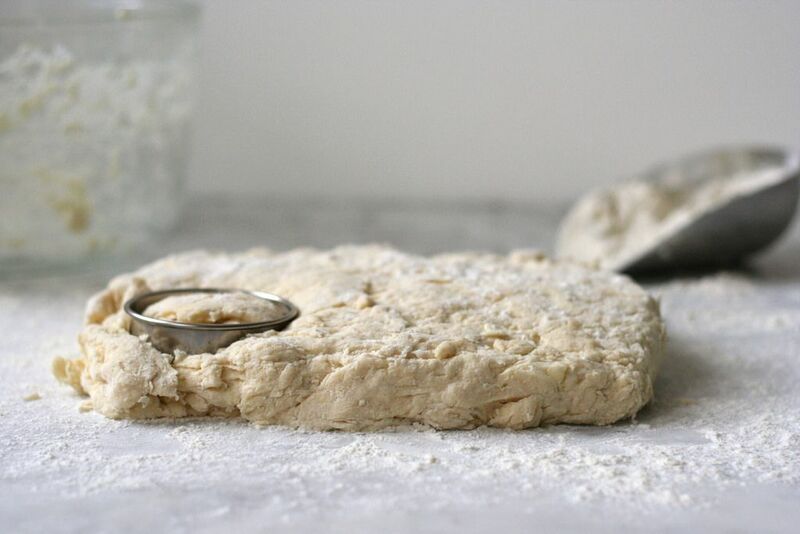 Lightly flour your surface and use your hands to shape the dough into a square or rectangle. The most important thing here is the thickness -- you want a generous height to begin with to make those gorgeously towering biscuits we all dream of. I like to shape my biscuit dough to about 1 inch thick. Use a floured biscuit cutter to cut out your biscuits and transfer them to your prepared baking sheets. More: Next learn how to make yogurt biscuits without a recipe. Take a moment and chill out. I’ve found that chilling my biscuits before I bake them is really helpful. Of course, I know from experience that any baked good that’s high in fat needs to be cold when it’s baked (and baked at a high temperature, to boot); this ensures that the butter melts properly, releasing steam that helps to leaven the baked good and produce flaky layers. Fifteen minutes in the refrigerator or 5 minutes in the freezer usually does the trick. Your biscuits won’t dramatically suffer if you don’t have time for this -- they just tend to spread out more, rather than gain vertical height (see below). The biscuit on the right was chilled before baking. Butter or egg wash: You decide. Once you’re ready to bake, you’ve got two options for finishing your biscuits: Brush them with melted butter or with an egg wash. For your convenience (and my own curiosity), I tried my biscuits both ways -- I often switch between the two. On the one hand, I like the boost of flavor a brushing of butter provides. On the other hand, egg wash makes the biscuits look shiny and golden brown. See below for the results. The biscuit on the left was coated with butter; on the right, egg wash. Decide for yourself: If you want pretty, go with egg wash. Or, you can get really crazy and brush the biscuit with egg wash before baking, then coat them with a bit of melted butter when they first come out of the oven -- the best of both worlds. They like it hot, hot, hot. Biscuits, like pies, breads, and most yeast-risen pastries benefit from a high oven temperature. 425° F is the magic number for my biscuits -- it creates steam as moisture evaporates from the butter, creating a burst of leavening straight out of the gate (a low oven temperature can cause the butter to melt, yielding flatter, less towering biscuits). Plus, the immediate burst of heat is a surefire way to get the best oven-spring from your leavening agent. Finish with flair. What can I say? I like salt. I like to finish my buttermilk biscuits with a sprinkling of flaky salt (coarse kosher salt works, too) after they’ve been buttered or egg washed. I just saw this recipe for the first time and it sounded absolutely delicious! I didn't read the comments before trying it (perhaps I should have) and was sorely disappointed by the results. My biscuits turned out as many below: hard, dense, and crispy--not light and fluffy. I used all-purpose flour, my dough had the various butter piece sizes, and was shaggy as the recipe called for. Did I do something wrong or does the recipe need some tweaking? I use a glass pie plate, and place the biscuits touching very closely together. I use self rising flour and full fat buttermilk. I usually refrigerate them before baking, and usually use cold fat. The fat is dependent upon the meal that I'm serving the biscuits with. If I'm using self rising flour, I don't add additional leavening agent. If using non-self rising, then, of course I do. I don't mop with milk or butter, but do serve them with much soft butter, and honey. Have you heard about that tip from the "Sundays at Moosewood Restaurant" cookbook? It suggests "cutting the dough into thirds and restacking it, pressing gently to bring everything together. This is to help encourage flakey layers in the biscuits. Again, you don't want to overwork the dough: just cut, stack, press gently and quickly a few times with the heel of your hand and repeat." That really does work, I've done it with the biscuits I make at Christmas and my half brother swears they're just like his grandmother used to make. She was a Southern woman, so I consider that a compliment of the highest order. While I hadn't seen that tip, I use a technique I found, perhaps in Cooks Illustrated, which calls for you to roll out the dough, fold it back onto itself like a book (basically the lamination technique from making croissants), and repeat 3-4 times in rapid succession. 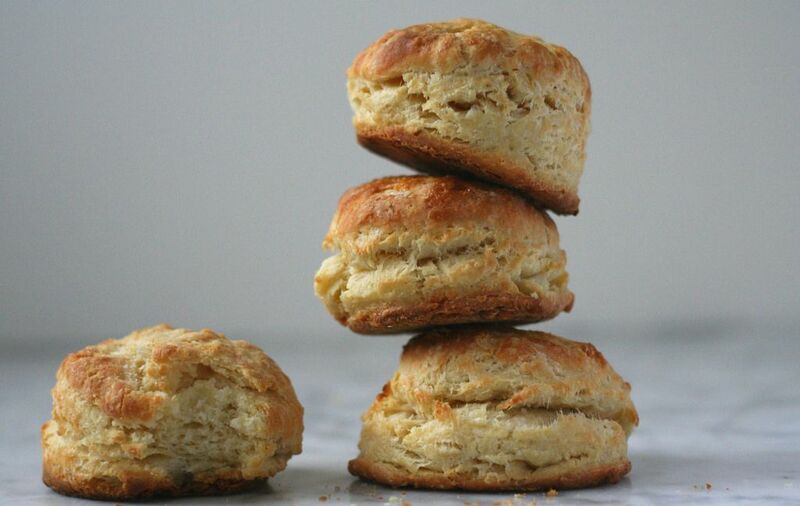 It creates amazingly flaky layers and is now my go-to technique for biscuits, no matter which recipe I choose to use. Thank you, LJ. It would be most helpful if the weight of the flour, above, were corrected, as it is in the recipe itself. I hate to think that people would see that and believe that 5 cups of flour = 22 ounces. (King Arthur Flour, incidentally, would put 5 cups closer to 21, but that 22 is based on Erin's actual measuring method, which of course is the better one to use in this case.) Thank you. ;o) P.S The method here is helpful, but I'm going to stick with the standard weight-based ratios professional bakers have been using for generations. They never me down. Also, I find that putting the biscuits close together increases the rise a bit more; and lately I've been baking my biscuits on a screaming hot "stone (refractory tiles from a kiln supply store) with great results. Just fixed it, thanks AJ. "So sorry some folks have had trouble with these! This has been my go-to biscuit recipe for years, but let me shed some light on the recipe from my end. From a scientific perspective, the answer to many of these concerns is this: if you make the cut in the butter properly, leaving large (walnut half sized) pieces of butter in the dough, there is a significant amount of natural leavening from the steam created when the butter melts inside the biscuits (the article attached to this recipe goes into greater detail). Because of this, there is a "medium" amount of added chemical leavener, which is then activated by the acid in the buttermilk to create the total leavening. That being said, if people aren't mixing properly or are having trouble, more baking powder could be an answer. Adding more baking powder will make taller biscuits, but it won't create flaky layers like the handling of the butter does - which is what I'm looking for when I make biscuits. I've tested the recipe again with some of AntoniaJames suggestions, and doubling the baking powder to 2 tablespoons produces a taller, lighter (fluffier) biscuit. It's not as flaky, but it's light and pretty darn good! Hope this helps some of those biscuit trouble-shooters out there!" I am quite wary to make these biscuits, as the comments in the recipe have yet to yield the light fluffy biscuits seen here. I can't imagine an AP flour (no matter how lovely and bleached) that would only require 1 TB of baking powder for 5 cups of flour. I am also disappointed that Food 52 editors would promote an article on Facebook that has so many questions and failed attempts. Yes, the pics are beautiful, but if no one can recreate it, why promote it? Great study of the art of biscuit making! One hint I learned was to use the sharpest cutter I could find ... my biscuits rose 50% in height. A cutter that actually cuts produces a raw biscuit edge that isn't smooshed. Vintage shops are great sources for finding the perfect biscuit cutter, mine has an extended handle and an open top. I made these and can't figure out why my biscuits were so heavy. Any ideas? I really want to make a good biscuit. My grandmother in Heaven is likely getting a good chuckle at how hard I'm working at something she did so easily. Yes, ditto! Article says to add more to self-rising flour (but cautions not to add too much) and then neglects to say how much more if using it. I'd love to know as White Lily around my area is all self-rising. Buttermilk is what's left after making butter so it's low fat by definition. Actually, buttermilk today is a cultured product and it possible to get a full fat product in some areas (like New England). Which is why it is sometimes better to make your own with whole milk and vinegar as mentioned in the recipe notes. It's possible to get anything if you change the definition. Where can you find whole buttermilk? I've been to every supermarket in L.A. including Whole Foods and all I find is Knudsens Low Fat Buttermilk. This is such a wonderful post.. the biscuits look sooooooooooooooo yummy! The picture of these beautiful biscuits look exactly like my Mother's biscuits from long ago--mouth watering and brings back memories of a dedicated home baker's kitchen. This recipe could be hers. I am making them next time I visit my daughter and grandson. Thanks for a reminder of the best breakfast ever. I've also stacked patted out quartered dough pieces on top of each other and rolled them out again to create flaky layers. It works great. This is such a beautiful, informative, and EMPOWERING post. Thanks for all the great info, Erin. Here's a useful tip on substituting for White Lily flour: http://chowhound.chow.com/topics/980906 by adding a touch of cake flour to Gold Medal flour to get the right protein level.